The beautiful island nation of the Maldives is a byword for luxury. Its resorts often hit world headlines for their innovative reimagining of opulence, including spectacular underwater hotel rooms and restaurants. Even within this decadent context, The Amilla in Baa Atoll, stands out as it encapsulates everything that draws a discerning group of travellers deep into the Indian Ocean again and again. Baa Atoll enjoys an unbeatable setting within a UNESCO World Heritage Biosphere Reserve, in the central western part of this Indian Ocean territory. Fiercely protected by law for the last six years, it houses a vast and important coral reef system. Boasting a truly dazzling variety of more than 250 corals and 1,200 fish species, green and hawksbill turtles, nurse sharks and sea birds also call it home. In addition, both of the most iconic Maldivian species, to which all divers and budding snorkelers aspire a glimpse, can be spotted here – graceful whale sharks and awesome manta rays. The Amilla residence on Baa Atoll has been carefully crafted to nestle in absolute harmony within its extraordinary natural setting. Its minimal, Asian-influenced design focuses upon light, space and making the most of the perfect year-round tropical climate. It is no surprise, given its seclusion and carefully-guarded privacy, that many a discerning jetsetter have chosen to stay at The Amilla. Attention to detail for such guests’ requirements includes self-contained entourage staff quarters, a security staff room, and a separate entrance for guests accompanied by security staff. For all visitors, the island’s staff offer a remarkable blend of warm welcome and hyper-professional and seamless service. 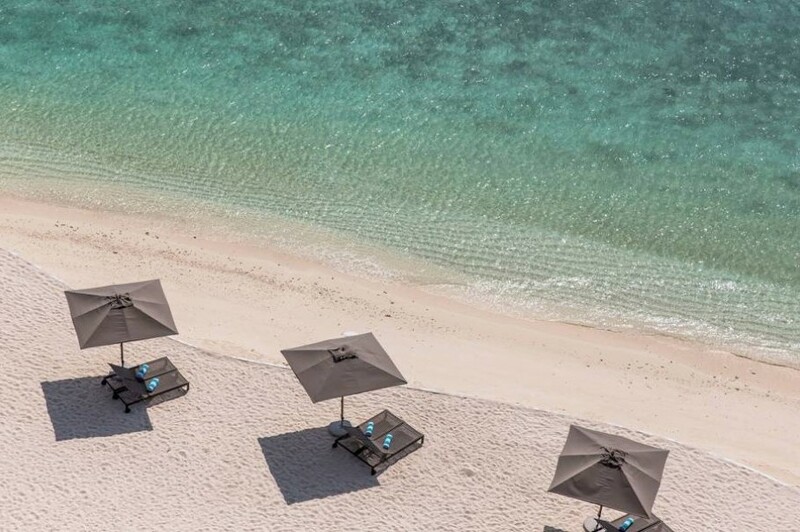 In total the atoll upon which The Amilla is situated offers eight properties, ensuring it is the perfect venue for diverse parties ranging from luxe-loving families to weddings and large-scale festivities. Naturally there are exemplary spa facilities on offer. The Maldives has led the world in revolutionising the use of nature and natural products in beauty and relaxation treatments. Drawing upon its rich organic and marine offerings, coconut oil, salt crystals and coral sand are just a few of the cornerstone elements of its reinvigorating, holistic spa experiences. Beguiling as it is on land, the seafaring attractions of the Maldives are even more special. A seaplane is a wonderful way to travel to many of the islands, offering a unique perspective on the otherworldly white and azure colours of its land and sea. The diving and snorkelling may well be the most insane on the planet, offering an immediate and reliable immersion in a teeming, benign world. Wildlife is tame in this natural paradise, and inquisitive dolphins, turtles and rays can offer some very close encounters, and a lifetime of memories. The Amilla is part of Amilla Fushi, a luxury retreat, and sister to brand new Finolhu, part of the popular Small Maldives Island Company. This article was guest edited by Paola Fiocchi Van den Brande. NINE is a private concierge club, providing tailored travel and lifestyle solutions to individuals and families globally.